Fazıl Say, our world-renowned pianist, will take the stage for the concert named “Ata’ya Saygı Konseri” (“Respect for Ataturk”) in order to commemorate Mustafa Kemal Ataturk on the 100th anniversary of May 19th, which is the first step towards our story of independence. 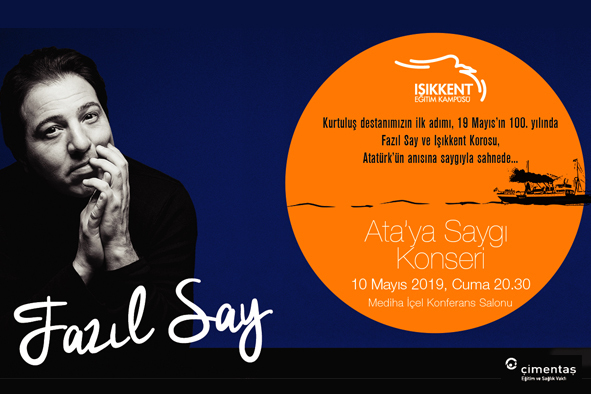 Isikkent Choir will accompany Fazıl Say in two songs of the concert, which will be held on Friday, May 10th at Mediha Icel Conference Hall. The announcements regarding the concert tickets were sent to all parents via email on April 8th. Tickets will be on sale for our parents and staff members only and will be sold online on our website.